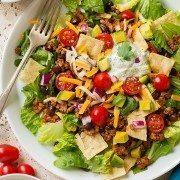 In my opinion this is the ultimate taco salad recipe! We eat a lot of Mexican/Southwestern food in my home because I love the delicious flavors in it. This taco salad is full of exciting flavors that all blend so perfectly together. 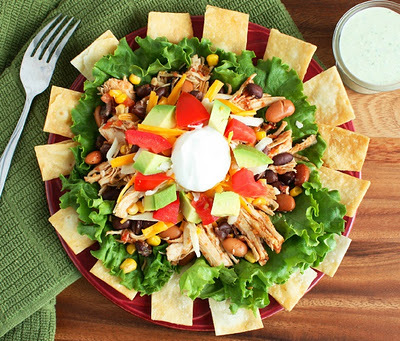 Anyone who tries this salad will want the recipe =). It is so simple to make! 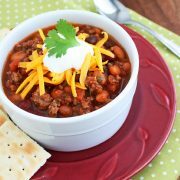 I love a good slow cooker recipe once in a while. Everyone have a great day and enjoy! Perfectly hearty loaded taco salad with chicken, beans, corn, cheese, avocado, ranch and chips! Place chicken in a slow cooker, pour salsa over chicken and sprinkle with taco seasoning. Place lid over slow cooker and cook on low heat for 5 hours. Remove chicken from slow cooker (leaving salsa broth in slow cooker), shred chicken and set aside. Pour black beans, pinto beans and corn kernels into salsa broth in slow cooker. Season with salt and pepper to taste. Gently stir in chicken and cook on low heat for about 15 minutes until all ingredients are heated through. 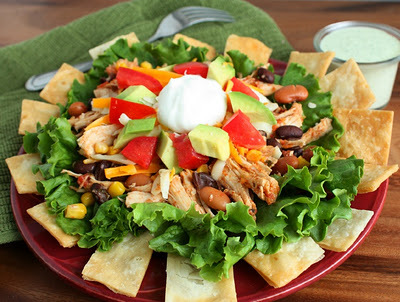 To prepare each salad, layer flour tortilla chips, lettuce, chicken mixture (scoop chicken mixture out of slow cooker with a slotted spoon), cheese, avocados, tomatoes, sour cream and drizzle with cilantro lime ranch. Serve immediately. Combine all ingredients in a blender and blend until all ingredients are finely chopped. Store in refrigerator. Kathryn George: Hi…not sure if this is true for everyone, but there is no link for the salsa and the taco seasoning. Has that disappeared?